Accepta 7104 is a high performance, eco-friendly bacterial treatment scientifically formulated for the control of algae in lakes, ponds and watercourses. It is based on a dry formula comprising an innovative blend of bacterial strains incorporated onto a gradually soluble support system. Specifically developed to aid pond, lake and watercourse clarification and silt removal, Accepta 7104 provides excellent curative and preventative solutions to chronically or accidentally polluted aquatic environments. Enclosed aquatic environments are very unstable and complex systems. Poor water renewal results in urban or industrial pollution having a very strong impact. Hydrocarbon or detergent spills form a film covering the surface of the water, slowing down the oxygen dissolution, damaging the biological balance. The absence of a current increases this effect and often leads to aquatic fauna and flora degradation. The complex blend used in Accepta 7104 is the highly efficient solution to these problems. Its mineral support, with high specific surface, enhances coagulation and flocculation of suspended material. Water clarification can be observed after just a few days of treatment. Bacteria fixed on the products support decreases in silt volume, mineralizing it and modifying its physico-chemical characteristics. The bacteria separated from its support will completely degrade the oily film produced by hydrocarbons or detergents. The bacterial strains of Accepta 7104 have a higher specific utilisation rate compared to naturally occurring bacteria that allow superior nitrogen and phosphorous consumption, stopping the Eutrophisation process and re-establishing normal air/water exchanges, promoting a healthy aquatic environment. Accepta 7104 will remain active giving high performance results even in low temperatures and the accelerated mineralization of sludge deposits on the bottom of the water body avoids anaerobic processes and bad odours. 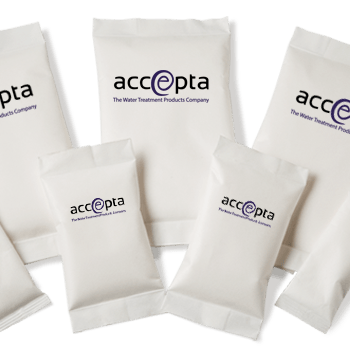 Accepta 7104 dosage depends on volume of water to be treated and pollutents to be degraded. Seeding : 250g/m2 of surface of water. Repeat operation until complete clarification. Maintenance: 120 to 150 g/m2 of surface of water. Apply maintenance dosage 2 to 3 times a year, preferably between spring and fall. If necessary, repeat operation 2 to 3 times a year. Accepta 7104 must be evenly spread over the surface of water to be treated. For further technical assistance concerning Accepta 7104 please contact Accepta.